Ben Affleck finally gets his chance to be Jason Bourne in the uneven movie The Accountant. To his credit, on paper, the movie should be spectacular. The film revolves around an accountant who sees the world very differently due to his high functioning autism. Those skills also make him a very dangerous assassin. Buried within The Accountant is a brilliant film but there is just too much going on and it bogs the whole thing down. The audience must keep track of three separate stories that only really intersect at the end. Each individual storyline would probably hold up well on its own. There’s the retiring government agent (J.K. Simmons) and his new protégé (Cynthia Addai-Robinson) who are tasked with finding out the identity of The Accountant, there’s The Accountant (Ben Affleck) and his damsel in distress (Anna Kendrick), a hitman (Jon Bernthal) and the head of a robotics corporation (John Lithgow) who has hired Affleck to go through their books to make sure everything is solid. The movie also incorporates multiple flashbacks of young Affleck and his brother dealing with his autism, just to hammer home a few of the points it may have missed. 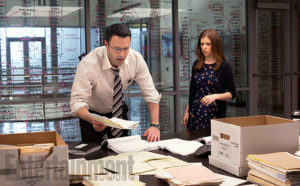 Ben Affleck and Anna Kendrick attempt romance in the thriller The Accountant. The end result is too muddled to really be effective. There are still some great action scenes and Affleck’s autistic, genius assassin is a fascinating character but the audience never spends enough time with anyone to really care about them. If they had simply kept the focus on Affleck and his brother, without all the flashbacks, it would have been a truly groundbreaking story. But the movie is so desperate to answer every single question that may come up that there’s no mystery left. When the big reveal finally does come at the end the audience has seen it coming for over half the movie so it loses all shock value. Yet because of its stellar cast the movie continually redeems itself. Director Gavin O’Connor has stacked the deck with some heavy hitters that could make even reading the phone book powerful. Lithgow is always welcome on screen and even Kendrick, who doesn’t do all that much, elevates the material she is given. Affleck does manage to play autistic well and with respect. It is clear the cast and crew did their research and it is never once played for comedy. If only the camera had spent more time on his unique condition instead of constantly bouncing the audience from story-to-story The Accountant would be a thriller on par with The Professional or The Bourne Identity.